He, like the various other officials who served on the Commission, certainly suffered from the resultant emotional strain, which accompanied daily confrontation with tragedy and evil. This was no doubt exacerbated by the fact that he, like many of his fellow commissioners and TRC staff, did not enjoy the luxury of distance and unfamiliarity with the painful and harrowing history they heard. 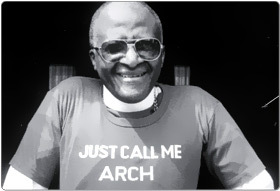 Tutu had himself bore witness to the Apartheid Regime and bore the brunt of its cruelty. All of these facets of Tutu's graceful and sensitive guidance of the TRC were crystallised on the second day of the TRC victim's hearings, held in East London on April 16, 1996. On this day, the widows of the Craddock Four appeared before the Commission. The Cradock Four were Fort Calata, Matthew Goniwe, Sicelo Mhlawuli and Sparrow Mkhonto. They were UDF activists(1) who were brutally killed by the security police in the Eastern Cape(2) on June 27, 1985(1). The starting point of the human rights hearings was the indefinable wail that burst from Nomonde Calata's lips in East London. Commissioner Alex Boraine, too, recalls this moment: "...the primeval and spontaneous wail... caught up in a single howl all the darkness and horror of the apartheid years. It was as if she enshrined in the throwing back of her body and letting out the cry the collective horror of the thousands of people who had been trapped in racism and oppression for so long. "(1) Calata's pain as she recalled her husband's murder prompted a silence broken by a call for an adjournment. After a brief break it was Tutu's singing of Senzeni Na? - a Xhosa hymn meaning "What have we done (to deserve this...)? "(4) - that absorbed and channelled the angst which had found release in that East London hall. But it was the testimony of aged and wheelchair-bound Sinqokwana Ernest Malgas, which reached out to Tutu in a more visible manner. It was Malgas's touching testimony, marked by his clumsy stroke-marred speech, that caused Tutu's weeping. Malgas was a veteran anti-apartheid activist whose dedication to the fight for liberation had rendered him the victim of unrelenting police abuse, arrest and eventual imprisonment(4) for a period of 15 years. (5) He broke down while narrating the horrific torture he was brutally subjected to by the security police. They had suspended him upside down, tied his hands and feet together and spun him around,(6) hit and kicked him(11) in a form of torture called the "helicopter". Tutu was overcome with emotion, buried his face in the table before him and sobbed "uncontrollably"(6) in a show of emotion that was as symbolic as it was touching. Tutu's words to the media at the end of the day's proceedings further demonstrate the unassuming humility that came to define his conduct at the TRC. He expressed self-doubt at his ability to bear the weight of the role assigned to him by then-President Nelson Mandela. (7) This open expression of fragility by Tutu is further testament to his role in the process - by bringing his own humanness and vulnerability to the table, he no doubt eased the way for the heart-rending task to be faced by countless victims who would follow suit, by bearing their pain in a public arena before perpetrators, fellow community members, media and a young nation. These extracts from Singqowakana Malgas's testimony illustrate the repeated abuse and detainment he was subjected to at the hands of the security police. They also point to the effects this harassment had on his family, resulting in the tragic and cruel death of his son. We witness the moment at which Malgas's composure crumbled as he described a brutal form of torture, which he suffered - an experience, which he seemed to be avoiding describing earlier in his testimony. This was also the moment when Archbishop Desmond Tutu dropped his head in his hands and wept. MS MAYA: You said you were in a boat, you said it was Rhodesia at the time. MR MALGAS: Yes, we were from Rhodesia and we went to Pretoria. From Pretoria we crossed the Zambezi River and went for military training and came back here. When I returned I went to the police here. MS MAYA: I request that Mrs Malgas should help to remind you of some of the issues. MR MALGAS: We went to the security plans and I met the security police there. MS MAYA: Were you already in custody of the police? MR MALGAS: Yes I was in police custody at the time. MS MAYA: And they accused you as a terrorist. MR MALGAS: Yes they did. MS MAYA: And then you were sentenced. MR MALGAS: And then the police here in East London were the ones who arrested me, and I was tortured there and persecuted, and I was still inside in custody, Sergeant Goert was the one who did these investigations and he called the police from Port Elizabeth. I was assaulted terribly. MS MAYA: What happened to you? MR MALGAS: What can I say? MS MAYA: Was the investigation final at the time, were you tortured and persecuted and we would also like to know what exactly they did to you when they were torturing you? ... I went to one of the rooms here at the police station in Pretoria. I was asked to give a statement about what was happening. Can I know, is my statement here? MS MAYA: Let's come to the appearance in court, were you charged, is it true that you were charged in Pretoria? MS MAYA: Yes, I was sentenced. MS MAYA: How long were you sentenced? MR MALGAS: I was sentenced for 22 years. MS MAYA: I am aware that when we look at the statement, you appealed about this sentence, and this was reduced, do you still remember for how long it was reduced to? MR MALGAS: It was 14 years. MS MAYA: So you were released. When you got home when you were released from Robben Island, you were taken again and placed under house arrest for five years, is that true? MR MALGAS: Yes it is true. MS MAYA: During this banning order, how was your life? MR MALGAS: You know my life was always the life of harassment, the detectives were always coming, I couldn't even go to work and my wife had to be a breadwinner. MS MAYA: For how many years did this go on? MS MAYA: And after '82 you were unable to get happiness. MS MAYA: So you were detained frequently and tortured each time you were detained. MR MALGAS: Yes it is so. MS MAYA: During this period, I gather that you had your house burned down. Can you please give us an account of what happened? MR MALGAS: I suspect that it was the Boers who did this and we were asleep at the time. My son was also asleep. MS MAYA: And he was Simphiwe, is that so? MR MALGAS: Yes, it is so. MS MAYA: Was Simphiwe also part of this torture? MR MALGAS: Yes, he was. MS MAYA: Simphiwe was poured with acid and do you remember the house was burned at that period. MS MAYA: Were you in the cells all the time? MR MALGAS: Yes I was in the cells. I was being beaten up all the time during all these periods I was in custody, but there was no charge against me. MS MAYA: Did this happen until 1989? PANEL MEMBER: Again in your explanation you state that one of the policemen who was torturing you and beating you, he had a few words with Faku Gus, I'm quoting from the statement, it is said: "You will get it dead!" That was Mr Faku who uttered those words. He said, when we get freedom, which will be over our dead bodies. MR MALGAS: I would like to say to them, if we freedom over our dead bodies, but I'd like to make them aware that we've got freedom. PANEL MEMBER: Thank you Mr Malgas. PANEL MEMBER: Mr Malgas, there is something in your explanation that I'd like to follow up. On the day when the house was burned down, I think I said your son was first burned with an acid. Again you say, due to this assault he died, is that so? PANEL MEMBER: Was an inquest done during this period? MR MALGAS: Not, nothing tangible had taken place during this period and we didn't have any opportunity to expose ourselves. DR BORAINE: Well Mr Malgas, I want to ask you a question, but if it is too painful for you to answer, that's fine. DR BORAINE: You have told us today that you were tortured many times in many different places. If you are able to and it's not too painful, could you describe some of that torture, what actually did they do to you? MR MALGAS: During the torturing, I was always suffocated with a mask and there was this helicopter training. A stick was put inside your knees and you had to stretch your knees. During that period you were suffocated. This article provides perhaps the best account of the Malgas and Calata testimonies and Tutu's response and mediation. 5. Singqokwana Ernest Malgas testimony before the Truth and Reconciliation Commission, Human Rights Violations Hearings, East London, 16 April 1996. From http://www.doj.gov.za/trc/hrvtrans/hrvel1/malgas.htm. While the newspaper reports covering Malgas' testimony put his term on Robben Island at 14 years, Malgas himself stated that he was imprisoned there for 15 years.